The genus Lactococcus consists of five phylo-genetically-distinct species: Lactococcus lactis, Lactococcus garviae, Lactococcus piscium, Lactococcus plantarum, and Lactococcus raf-finolactis (Figure 2-3).They are all non-motile, obligately homofermentative, facultative anaerobes, with an optimum growth temperature near 30°C. They have a distinctive microscopic morphology, usually appearing as cocci in pairs or short chains. One species in particular L. lactis, is among the most important of all lactic acid bacteria (and perhaps one of the most important organ isms involved in food fermentations, period). This is because L. lactis is the "work horse" of the dairy products industry—it is used as a starter culture for most of the hard cheeses and many of the cultured dairy products produced around the world. There are actually three L. lactis subspecies:L. lactis subsp. lactis, Lactococcus lactis subsp. cremoris, and Lacto-coccus lactis subsp. hordinae. Only L. lactis subsp.lactis andL. lactis subsp.cremoris,how-ever, are used as starter cultures; L. lactis subsp. hordinae has no relevance in fermented food manufacture.Another variant of L. lactis subsp. lactis, formerly named L. lactis subsp. 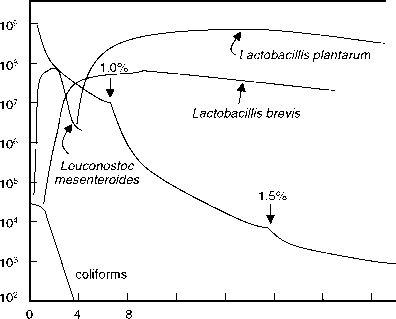 diaceti-lactis (or Lactococcus lactis subsp. lactis bio-var. diacetylactis), is distinguished based on its ability to metabolize citrate.This species is not included in the current List of Bacterial Names, and instead is encompassed within L. lactis subsp. lactis (see below). However, Lacto-coccus lactis subsp. diacetilactis is listed in Bergey's Taxonomical Outline of the Prokary-otes (2004 version). Plant material has long been considered to be the "original" habitat of both L. lactis subsp. lactis and L. lactis subsp. cremoris. The suggestion, however, that milk is now their "new" habitat is supported by several observations.